Gold has bottomed at $1321. I know not one person that has been willing to go on the record and post what I have posted. No individual has yet called the bottom for gold, and I have already gone on the record announcing the bottom only two days after gold hit $1321. The recent drop (just a re-test, in my view) was just four trading days and only $100 off—and folks seem to have forgotten that my Bottom call of April 18 has (so far) held beautifully! I sold my gold at $1900, as you are aware, and the $1321 bottom has not failed me. For those of you who simply buy and hold Gold and Silver: sleep well, my friends, and know that your decision is a wise one into the year 2020, when they will top! 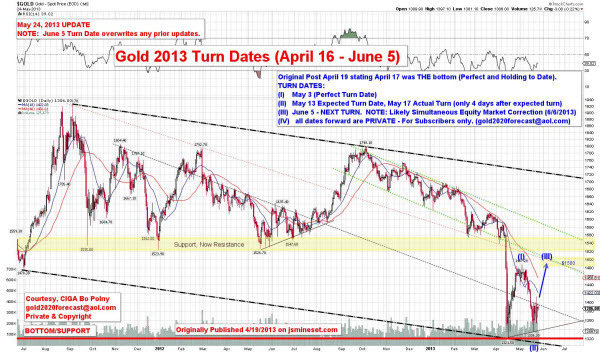 I have received numerous requests for an Update to the prior dates and charts posted on jsmineset.com. I have waited this week as I have been closely watching the gold market, and I wanted to be certain of the next date I post. The market continued to plunge another $200. The bottom is in? We all want a someone to lead us to the promised land. This entry was posted in YOU and tagged bopo, Technical Analysis. Bookmark the permalink.